This chapter, the final of the Psalms we recite on festivals as part of the Hallel service, begins by calling upon all groups among Am Yisrael to give praise and thanksgiving to God. The first four verses repeat the refrain "Ki Le'olam Hasdo" – "for His kindness is everlasting," emphasizing that as God's kindness has no limits, so do we bear an unlimited obligation to express praise and gratitude. In the subsequent verses the Psalmist describes God's deliverance of His nation from the enemies that had surrounded them. Although there was no foreseeable means of escape or possibility of survival, the Jewish people emerged victorious. The "stone rejected by the builders," meaning, Am Yisrael, whom the other peoples of the world dismissed, rejected and deemed worthless, "became the cornerstone" – were recognized as God's special nation in whose merit the world is sustained (verse 22). Though we were looked upon as a condemned, hapless people, God lifted us to the prominence and stature to which we were destined. 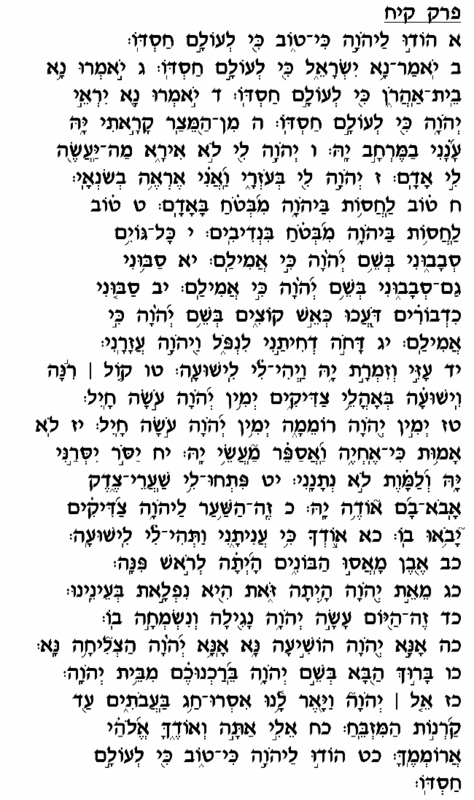 Towards the end of this chapter (verses 26-27), the author records the greetings extended by the Kohanim in the Bet Ha'mikdash to those who have come to offer thanksgiving sacrifices to God. The visitors respond by declaring to the Almighty, "You are my God and I shall give You thanks!" (verse 28). As noted by several commentators, these verses appear to indicate that this chapter speaks of the time of Mashiah, when Am Yisrael will be delivered from its enemies and the Mikdash will be rebuilt. We will then all be obliged to bring offerings of thanksgiving to the <?xml:namespace prefix = st1 ns = "urn:schemas-microsoft-com:office:smarttags" />Temple, to express our endless gratitude to the Almighty for bringing us our long-awaited redemption, delivering us from exile, and granting us the opportunity to serve Him in the Bet Ha'mikdash.